Hard day at the office? Deborah (Dott Cotton) knows exactly how you feel. 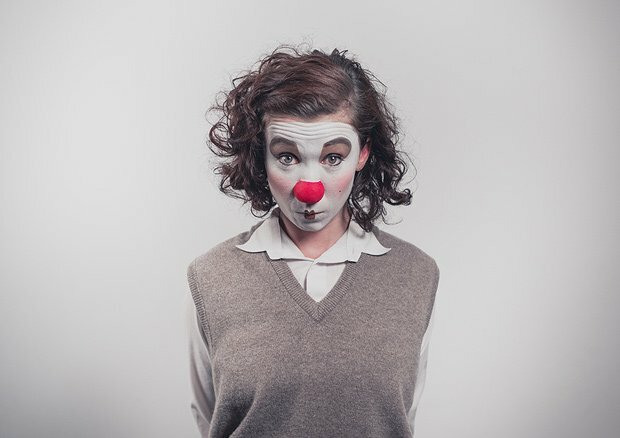 A vintage clown in white face and red nose, Deborah's first day starts innocently enough, wondering how she can extend her lunch break and just what those naff ornaments on the desk are. But this being a Familia de la Noche production, it's no mere IT job: Beadledom HQ deals in the business of death. With a disarmingly sweet smile and a sigh, Deborah dons the reaper's cloak and skull mask, presiding over a series of increasingly bizarre and grisly deaths (here represented in short animated films). A lever is pulled as another person dies. The trouble is, she can't keep up with the paperwork, and her own biological clock is ticking. Time to put on a white coat and write out some prescriptions. Deborah's bouffon character fuses silent movie whimsy with real melancholy, every eyebrow raise or smile evoking Lucille Ball or Buster Keaton. The show posits big ideas about agency, DNA, motherhood and playing God. It may run out of steam towards the end, but Cotton's inspired lunacy and movement choreography is always compelling. Spesh Maloney's exquisite soundtrack, ranging from klezmer to classical, complements a highly charged, witty meditation on mortality. The out tray has never seemed so sinister.